San Lameer Resort Hotel and Spa is situated on the iconic San Lameer estate near Southbroom on the KwaZulu Natal South Coast. The hotel itself is situated on the banks of the tidal Umhlangamkulu Lagoon and guests have direct access to pristine Blue Flag status Indian Ocean beaches. The accommodation on offer at San Lameer includes forty rooms and suites elegantly decorated in contemporary Indonesian style. In this extensive and secure beach and golf coastal reserve, guests are surrounded by beauty, luxury and tranquillity. You can choose from our available classic rooms, deluxe rooms, executive rooms or suites where most of these bedrooms have balconies with beautiful views and as an additional feature these bedrooms are also inter- leading for families requiring separate bedrooms. All rooms also have open plan en-suite bathrooms. 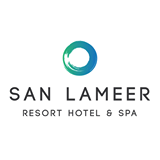 San Lameer Resort Hotel and Spa’s newly refurbished, state of the art conference and banqueting centre can comfortably accommodate 200 guests for conferencing and can also be used as a venue for weddings and private functions with space for up to 180 guests. There are a number of options available in terms of packages and we can tailor your wedding to your specifications.